Kevin Keegan and I came out in spots this week when England’s 2014 World Cup qualifying matches were announced. It was the news that the Three Lions will finish their campaign at Wembley against old foes Poland that suddenly brought buried painful memories to the surface. For my old mate Kev it reminded him of the night he got caught with his trousers – okay, his shorts – down. And for me, it recalled the end of my reign as chief football reporter on the Daily Express. England have faced Poland in seven qualifying campaigns for various World Cups and European championships, and twice it has all come down to the final match at Wembley. Come with me back to October 1973 for the one that, even after nearly 40 years, sits in the memory bank like hot cinders. Football writers of my generation will confirm that it was the most one-sided match ever witnessed at Wembley, in the days when the stadium was famous for its Twin Towers rather than its single Arch. For those who were not around then, let me tell you that England had 35 goal attempts to two by Poland, but it was the Poles who went through to the 1974 World Cup finals at England’s expense. 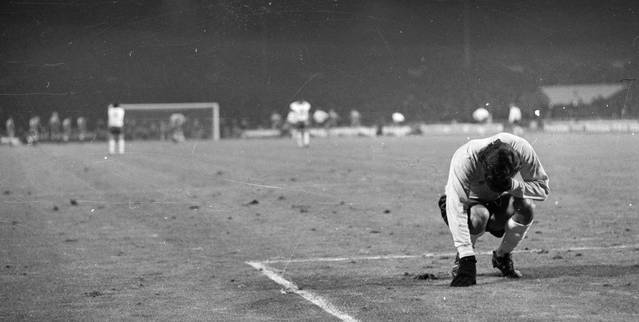 Sir Alf Ramsey’s men needed a win but could manage only a 1-1 draw, a result that pitched the nation into mourning. Poland had the man of the match in goalkeeper Jan Tomaszewski, who during the build-up to the game on ITV was famously labelled a clown by razor-tongued pundit Brian Clough. Tomaszewski gave England nothing to laugh about as he saved at least half a dozen goals with eccentric but effective goalkeeping. After surviving non-stop pressure, it was Poland who took the lead in the 55th minute in a rare breakaway raid. Of all people, it was Norman Hunter – “Bites Yer Legs”, the most feared tackler in English football – who mistimed a challenge out on the touchline and the ball was transferred to unmarked Domarski. 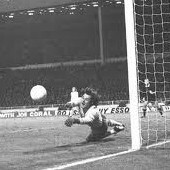 Then, of all people, it was Peter Shilton, one of the greatest and safest of all goalkeepers, who mistimed his dive and allowed Domarski’s low shot into the net. Allan Clarke equalised from the penalty spot eight minutes later to trigger a non-stop bombardment on the Polish goal, but the calamity of an England exit became more likely with every missed chance. In the closing moments the tragedy briefly turned to Monty Pythonesque farce. Kevin Keegan, on the substitutes’ bench, recalled: “Alf Ramsey proved yet again that he was uncomfortable with the substitute rule when he left it until the 85th minute before he decided to make a change. Bobby Moore was sitting alongside Alf after being dropped and kept nagging him to get a sub on. There were just 90 seconds left when the Derby Country striker at last got on to the pitch, and with his first and only touch of the ball put the ball wide from two yards. The game finished at 1-1, and England were out of the World Cup. It all led to Ramsey getting the sack, and in one of my rare exclusives I managed to get him to confess that the reason he left the substitution so late was that his watch had stopped. He’d thought there was still plenty of time left. I was so depressed by the result and the knowledge that the 1974 World Cup finals would be England-less that the following Monday I handed in my resignation, and I have been freeloading – sorry, freelancing – ever since. I walked out without a redundancy package. What a dummy. Note to any staff journos reading this: Never resign. Wait for the sack and any compensation money you can gather. Don’t be a plonker like me. WHAT AN UNCOMFORTABLE time this is for any self-respecting journalist as our wonderful trade is ripped into daily at the Leveson Inquiry. 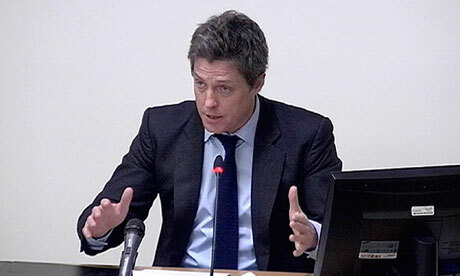 Hugh Grant: under oath, but where's the hard evidence rather than conjecture? I just wish Lord Justice Leveson would be more insistent on his witnesses sticking to the facts rather than their conjecture. They are being permitted to make the sort of sweeping statements that would be quickly objected to in a proper court of law. There is yet to be any smoking gun evidence that the hacking has been widespread outside the Wapping Walls of News International, but the likes of Hugh Grant are being allowed to surmise that the Mail, for example, tapped into his phone “because there is no other logical explanation”. I am no lawyer, but I am sure I could come up with several suggestions for how stories are leaked. It is clear that story-gathering by newspapers needs to be given new discipline and direction, but we must all fight against any prospect of encroachment on the vital freedom of the press. Let’s have a Press Complaints Committee with real teeth, and a neutral ombudsman who can protect the innocent and come down heavily on the guilty. I watched some of this week’s hearing in the company of Sean Gallagher, a student journalist from Brighton University who was interviewing me for a university assignment. He asked what advice I would give to a young journalist just starting out. I had to tell him to look beyond newspapers, and to aim for the wider media market of broadcasting. The days that I enjoyed of starting out as a copyboy and then progressing to newspapers as a reporter have long gone. As the newspaper industry slowly disappears like the setting Sun, journalists will be replaced by media-ists. The web is a vast, unexplored ocean. So far we have only got our toes wet. Young journalists – sorry, media-ists – like Sean should hurt their brains to make the internet work and earn for them. Few writers have so far discovered how to make it pay. But the future is in the web, and one day somebody like Sean will have people reading his words on wristpads that will not stop, unlike Alf Ramsey’s watch. The future is in the internet, and I cannot think of any more exciting time to come into our old profession. For the thinking journalist there is a world rich with promise literally at their fingertips. JOIN THE SJA and benefit from a recognised press card, priority entry to key events and significant discounts and members offers on a range of activities, including entry fees for the SJA British Sports Journalism and Photography Awards.